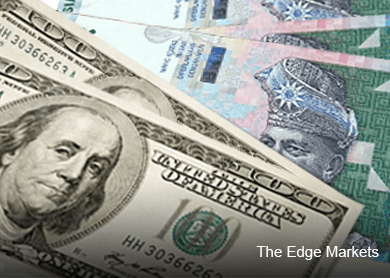 KUALA LUMPUR (July 2): The ringgit fell the most in almost two weeks as investors switched focus to Friday’s U.S. jobs data to gauge when the Federal Reserve will raise interest rates, a move that could spur outflows from Malaysia. The currency dropped 0.6 percent to 3.7698 per dollar as of 9:04 a.m. in Kuala Lumpur, after gaining 0.7 percent Wednesday as Fitch Ratings refrained from cutting the nation’s credit rating and lifted its outlook to stable from negative. The ringgit declined to a decade low of 3.7887 on June 29 amid investor concern that a downgrade was imminent. Malaysia is vulnerable to a U.S. rate increase because of the relatively high foreign ownership of government debt, while concerns still linger about the nation’s finances and state investment company 1Malaysia Development Bhd. Figures due Friday may show the nation’s exports contracted in May, which would be the fourth month they have done so this year. Fitch said in a statement Tuesday that a new consumption tax introduced in April and fuel subsidy reforms are supportive of Malaysia’s finances, even as government debt guarantees increase. The company warned in March that the chance of a rating cut was more than 50 percent. It kept the rating at A-, the fourth-lowest investment grade. The ringgit will probably still weaken to 3.8 against the dollar by the end of this year, according to Credit Suisse Group AG and United Overseas Bank Ltd. That’s the level it was pegged at during the Asian financial crisis until the fixing was scrapped in July 2005. Exports fell 8.7 percent in May from a year earlier, according to the median estimate of economists in a Bloomberg survey. They contracted 8.8 percent in April.